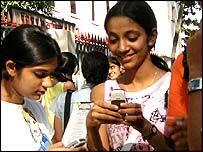 Karnataka, India banning cellphones for kids under 16? We can't even imagine what would happen here in the US of A if our government suddenly stopped everyone under the age of 16 from chatting it up on a mobile, but it looks like we just may find out how it goes down overseas when Karnataka, India does just that. Reportedly, its government is going to "ban cellphone use by children less than 16 years on the basis of advice of medical experts," and while specifics weren't divulged, apparently someone up high believes that "prolonged use of [handsets] by teenagers does affect their health" in an adverse way. Additionally, mobile dealers will no longer be allowed to sell handsets to youngsters under 16, and while a hard date for the ban hasn't been announced just yet, notification should be "issued soon."